I think this is the one question I'm most often asked and it is a difficult one to explain. I hope that with the following information, you will have a better understanding of what the Akashic Records are. I also offer some suggestions for possible questions. The Akashic Records are the past, present and future knowledge of all things. It is a record of the Soul's journey since its inception as well as possiblilites of it's future enfoldment. The Akashic Record is referred to in virtually every ancient spiritual teaching. It is known in the Bible as "The Book of Life". During an Akashic Record consultation, the records of your soul are opened and with your permission, information from this profound and sacred spiritual level come forward. The information, insights and guidance you receive from this experience will be useful in resolving current life challenges. It will bring your attention and energy into the present moment, which allows you to focus your understanding toward fulfilling your life purpose. Specifics from past lives may or may not be relevant. What is particulary valuable is guidance as to how to work through patterns present in your current life and opportunities for growth and direction. I work with the Light for the Highest Good of all concerned. I will work with your questions; so, it is important to prepare yourself by reflection on your current circumstances and where you would like greater clarity. Your openness determines, to a large extent, what happens during the session and what spirit can bring forward. Please remember that the consultation and healing given in the session is presented to assist you. You may choose to share this experience with others, but you are responsible for their receiving the information as it is recounted or interpreted by you. As a consultant/Instructor, I open myself to the information available from your records and allow myself to look and to say that which comes directly to me. I do my best to relay what I am given to the best of my ability, presenting you with all that is conveyed to me during the Akashic Record consultation, in confidentiality. It will be supportive if you understand that no matter what I say, you are responsible for reviewing the session on the context of your own life. Please consider the overall impact of our moments together as we allow Spirit to move through our path. You may feel the effect immediately or after months, or both. This consultation is intended to provide general and inner developmental information only, and is not intended as medical advice, psychiatric or psychological evaluation, diagnosis, or treatment. The consultation and The Peaceful Healing Tree are not engaged in providing health or psychological service, or medical advice to the individual client. Consult your physician or health care provider regarding particular health matters. The consultant and The Peaceful Healing Tree disclaim any liability arising directly or indirectly from any information given or received in the consultation. *Note: for people under 18 years of age I do not open their Akashic Records. The most difficult part of a consultation I always found, was coming up with the questions to ask. Although you may ask questions that require a "Yes" or "No" answer, bear in mind that's exactly what you'll get in return. With that in mind, some suggestions would be; What limiting thoughts, patterns and beliefs are keeping me from moving forward at this time? What can help me to release these limits so I can move forward: What are my greatest fears? What lesson do my challenges have to offer me? How can I resolve a "specific" issue in my life? What gifts do I possess that can help me with "specific" issues? What can I do to improve my relationship with "___"? What message does my spirit guide and/or guardian angel have for me at this time? You can go as deep as you want into any scenario, by asking the next question based on the answer you receive from the first. 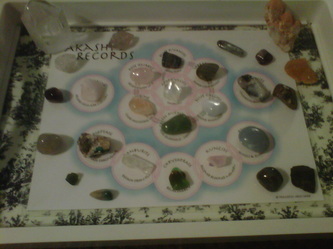 We can also do some soul level healing by asking the Records how to release and clear the blocked energy. If you are willing, you may come with no questions and actually ask the Record Keepers what they would like to talk to you about today or bring to your attention to learn right now. This is an open ended question and can quite often bring with it many surprises. If you do not know what question to ask next, you can ask the Record Keepers what is the question that would best suit you to ask now and it will be revealed. Each consultation is individual and unique to you, so I ask everyone to be open to receive what is theirs. My intention is always whole heartedly, to do whatever it is I am asked of for you and the highest good of all. I work with the Lord's of the Akashic Records, your guides and angels. This is NOT a parlour game. Although you may ask what your dearly departed Aunt Mildred was wearing at the time she passed away and that answer may or may not come through, it is not what the Akashic Record consultations are best served by. The consultation is intended to help you on your healing journey by helping you discover, understand, clear or learn to work through blockages and issues in your life that are causing you stress and discord, or helping you to awaken to and learn to live your soul's purpose with an opportunity to meet and work with your guides and angels and receive messages of inspiration and guidance from them. Although it is possible for past loved ones to come through with messages it is not what the session should be centered around.